Hm, what if it was reworded to something like: "Figures rolling attack or defense dice while adjacent to Gor'Vath may not roll less than 1 die because of Fetid." That would clarify that the minimum is applied immediately before the roll, after all other effects have been applied. i.e. the figure's dice can be reduced below one, but after all effects are applied, it goes up to a minimum of one, as opposed to "Fetid may not lower attack or defense dice of any figure below 1," which implies that the number of dice cannot go below one at any point in time. "After applying any other attack or defense dice bonuses, Unique figures adjacent to Gor'Vath roll 1 less dice for all attack and defense rolls, while common figures roll 2 less dice for all attack and defense rolls. Figures rolling attack or defense dice while adjacent to Gor'Vath may not roll less than 1 die because of Fetid." to make it as explicit as possible. I know this isn't the place for workshoping, I just want to know if there's any way this could be worded that would be acceptable to you. I'm curious if the other judges are of the same mind as Killometer. Futhermore, I know it is nitpicky, but it should be "all normal attack rolls". As worded, it would seem to apply to special attacks too. Or perhaps refer to the attack and defense numbers instead of the dice. I agree with Killometer on this point. While the suggested changes do fix the issue (in particular the second suggestion), I really do not like the idea of introducing a minimum value that is different that the standard minimum (zero). Regardless of how it is done, it creates the necessity of an ordering for +/- dice powers, even if that ordering is specific to one unit. That would set a precedent for more powers to do the same, any other powers that also try to specify "after applying any other bonuses" would conflict poorly with Fetid. At first I thought these where way over priced with how weak they are but after playing them I think they pretty close…I still think they would be good around 40 points. The ability to have 9 special attacks is where they make up their points, even if it is only 9 attacks of 1, it only takes one wiff to take down Deathwalker, also no scattering if they attack Reavers. This custom screams dungeon crawl and completely makes you think that you are playing a bunch of rats that are quickly scurrying across the board…which fits the chosen figure perfectly. Adding to the theme is their stats and special abilities. Scramble 2 makes them pretty fast when moving across a board with small elevations. And, Ravenous Swarm Special Attack gives the feeling of being bitten be bunch of rats around your feet. Being a Castle Ravenloft piece Auggies has a lot of these in stock so it will be cheap and an easy paint job to get the desired amount of figures. These are not the easiest unit to play as they don’t have any bonding or any synergy other then Devourer Attack Enhancement from the Dumutef Gaurds. Because of this I found myself trying to include them in builds of Dumutef Gaurds and Death Knights. But, doing so meant that they saw little action until they were the last unit remaining. I also found it hard to take them as filler in other builds, as there are many other and better options. However, they are great filler in a dungeon crawl setting. They also have an inherent weakness due to their Height…they can’t climb anything of a height of 3 which includes battlements. But, they also have a great strength due to the figures actual height…it is very easy to hide them from enemy ranged units, which pick them off very easily. While playing them I found that due to their weak stats and lack of usefully synergy that they are designed to be a mid game unit. But, finding the OM’s to use them is tricky, as to not loose what is already out on the frontlines. Again the Rat Swarms are not the easiest figures to play. They are not a first wave or assassin figure because of their low attack and defense. They are also too weak to be a clean-up character for the same reason. That leaves them right in the middle. They have great theme which is really important to me and they are great in a dungeon crawl setting but, I don’t see them ever being used much in tournaments. They open up a new category for future customs to build upon…like a “rat king” or other larger rat heroes or even more rat squads. Which is something that we need as the age of customs continues. All of which I would love to see. That’s a hint to all of you custom creators wanting to submit units to the SoV. I vote YES to induct the Rat Swam into the SoV. I would like to nominate another unit created by one of the judges. I know that only Auggie carries these but he has 636 in stock which means that is 159 squads. and each person only needs 1 squad as they are unique. Im real excited to see the Tentacles fo the Kraken submitted. I have played several games with them and have really enjoyed them. Early game drops of these guys make it really tempting to put them at the edge of the water and try and grab things off, however it is really important to remember that they actually have a range of three. It is also relly fun to bring tentacles back from death and very thematic. I think this figure would make a great addittion to Heroscape and am excited to see what others think of it. Thanks for the submission! I am glad you guys like them. Here is a link to the design discussion thread. I love these guys, very fun idea, cool to support Auggie and all he does for Scape. However, I have reservations about the amount of text on these cards (wow! ), the ability to bring back tentacles without limit (I assume I read that right--previously destroyed tentacles can be replaced, with the right roll, even after all are destroyed), and the use of (as I understand it) 4 identical sculpts. None of these are absolute dealbreakers, but all of them give me pause. I'll think these over more and vote soon. I far prefer the Cthulhu Tentacle to the Kraken Tentacles. It also adresses your concerns about the Krakens, 1Mmirg, though I'm sure you would have other concerns. If these fail, I'll probably nominate the Cthulhu. 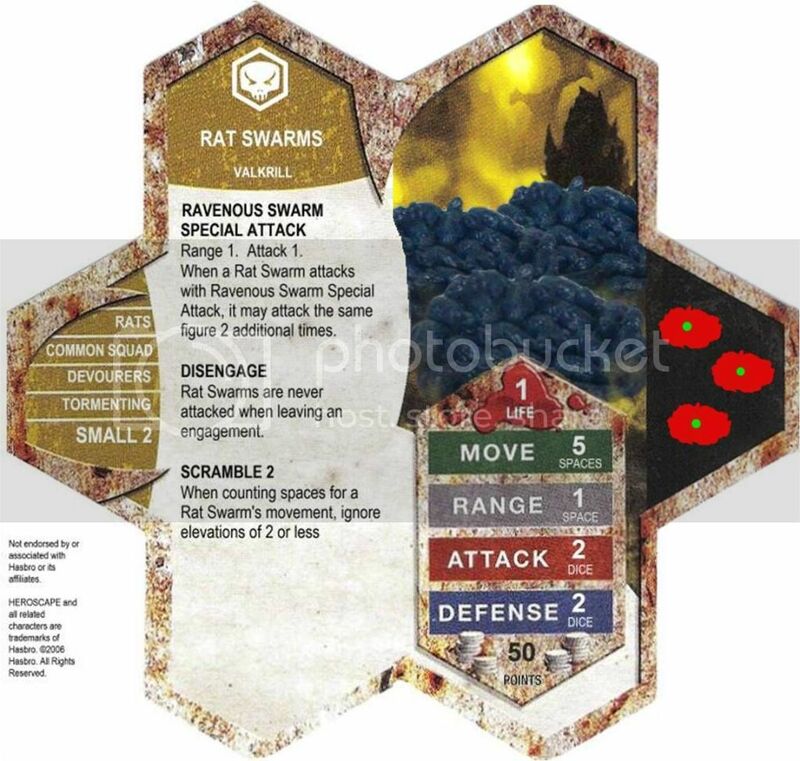 Overall, the Rat Swarm does play well, and its theme fits the subject. However, I am unimpressed by the figure chosen for the card, and the card does not fit the Heroscape universe. All things consider, I vote NO to inducting the Rat Swarm into the Soldiers of Valhalla. Yes it uses only one sculpt...but I wanted them to be a squad so I had to. Also, yes you can continue to bring back tentacles even after they are all destroyed...think of Pirates of the Caribbean 2 when the Kraken attacks the black pearl and they think they killed it (all of it's tentacles) and then it comes back and eats Jack and sinks the black pearl...that is what I was going for. Also, remember they are bound to water tiles so it is not hard to avoid them...depending on the map. I don't think the ability to bring back tentacles is as big a deal as you think. The Marro Warrios do a very similar regeneration and also benefit from being in the water. I am not a fan of same figure squads, however, the Tentacles of the Kraken represent appendages of the same figure. I would expect them to look the same. The Rat Swarms figure also really pulls off a same sculpt squad, just because of the swarm mentality, dozens of the same creature in the same place at the same time. My one problem with the card is the amount of text though. It is not a figure that I would just give a first time player because they would be completely overwhelmed by the text. On the other hand Tor-Kul-Na has a massive amount of text and that is only for one ability. There is a precedence for a lot of text and I definately think that there is a point to all the text.